Shareholders may be in store for a poor harvest. 2015 was a challenging year for Deere (NYSE:DE). The manufacturer of agricultural, construction, and forestry machinery suffered through a 20% decline in sales and a 39% plunge in profits as lower commodity prices and slowing global economic growth reduced spending on new machinery. Deere's stock price reacted in kind, falling more than 13% during the year. 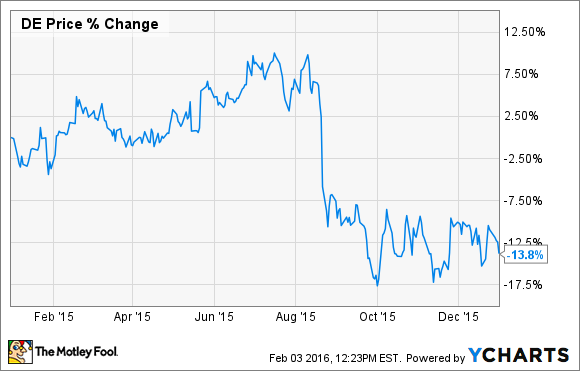 Unfortunately, it appears Deere's shareholders may be in store for more pain in 2016. Here's why. Deere's management has for years said that the company benefits as farmers' incomes rise, which tends to increase their willingness to spend on new machinery. However, the reverse is also true. 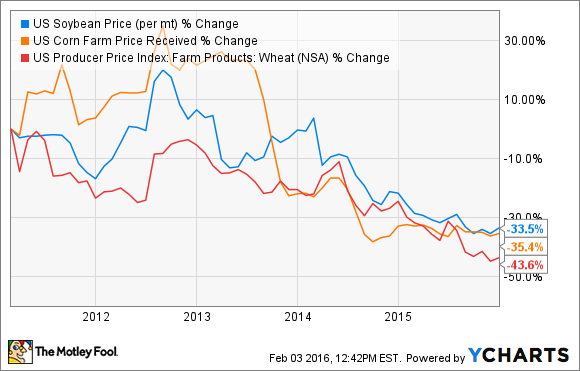 And the significant decline in major crop prices over the last half decade is putting pressure on farmers' profits. U.S. Soybean Price (per mt) data by YCharts. These factors contributed to a 25% drop in Deere's agriculture & turf segment sales in 2015. And with farm cash receipts expected to remain stagnant in 2016 after last year's estimated decline of 8%, management is forecasting the company's sales of agriculture and turf equipment to fall an additional 8% in fiscal year 2016. Deere's construction & forestry division also struggled in 2015, with sales falling 9% and operating profits dropping 19%. Looking ahead, management expects more of the same and is forecasting Deere's construction & forestry sales to decrease an additional 5% in 2016. As with Deere's agriculture & turf business, macroeconomic factors are also taking a toll on its construction operations. China's massive economy is slowing, and that's leading to a reduction in infrastructure spending. And here in North America, the downturn in the energy industry brought about by low oil prices is further reducing demand for construction equipment. These trends aren't specific to Deere. Rival construction equipment maker Caterpillar (NYSE:CAT) also saw its sales and profits decline in 2015 due to lower infrastructure spending. And Caterpillar, too, is forecasting continued sales weakness in 2016, with the midpoint of its revenue guidance representing a year-over-year decline of more than 10%. As participants in a highly cyclical and commodity-price sensitive industry, there isn't much Deere or Caterpillar can do to offset these negative macroeconomic trends. The companies are trying to streamline their businesses through cost-cutting and restructuring, but that can only help to mitigate the damage caused by lower sales. These factors are also helping to bring about another worrisome trend: Deere's leasing activity has increased while sales growth has slowed. This could become a problem if it results in an oversupply of used equipment in future years. In that scenario, Deere could be forced to slash prices to clear out excess inventory, which, in turn, could put downward pressure on new equipment pricing. [John Deere Financial] has not been encouraging customers to utilize leases in general or short term leases specifically through pricing or residual values. Leasing, however, is becoming more attractive to many of our customers. That's because of an uncertain business environment, coupled with the lack of confidence and clarity in tax incentives. Whether or not management is actively encouraging leasing does not change the fact that leased equipment is steadily increasing as a percentage of Deere's portfolio. And that could result in Deere being forced to reduce prices -- and suffer the corresponding hit to its profit margins -- in the years ahead. All told, lower commodity prices, a slowing global economy, and the potential for significant pricing pressures are all likely to weigh on Deere's stock price in 2016.